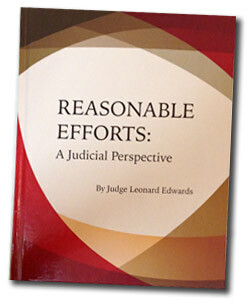 by Judge Leonard Edwards, publication made possible by the generous support of the Casey Family Programs and Philanthropic Ventures Foundation. Aggravated Circumstances: When are Reasonable Efforts Unnecessary? .mobi file—can be opened in Kindle, including Kindle reader for PC. .epub file—can be opened in various eBook readers, including iBooks on iPad, and Adobe Digital Editions reader for PC. .pdf file—can be opened in Adobe Acrobat Reader and similar readers. There is no charge for the book, but there will be a small charge for shipping and handling.